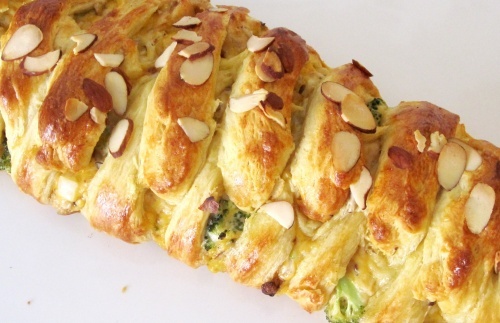 In a large bowl, toss together chicken, broccoli, mushrooms, garlic, cheddar cheese, mayonnaise, salt, almonds and onion. Unroll crescent roll dough and arrange flat on a medium baking sheet. Pinch together perforations to form a single sheet of dough. Using a knife or scissors, cut 1 inch wide strips in towards the center, starting on the long sides. There should be a solid strip about 3 inches wide down the center, with the cut strips forming a fringe down each side. Spread the chicken mixture along the center strip. Fold the side strips over chicken mixture, alternating strips from each side so they overlap to form a braid.